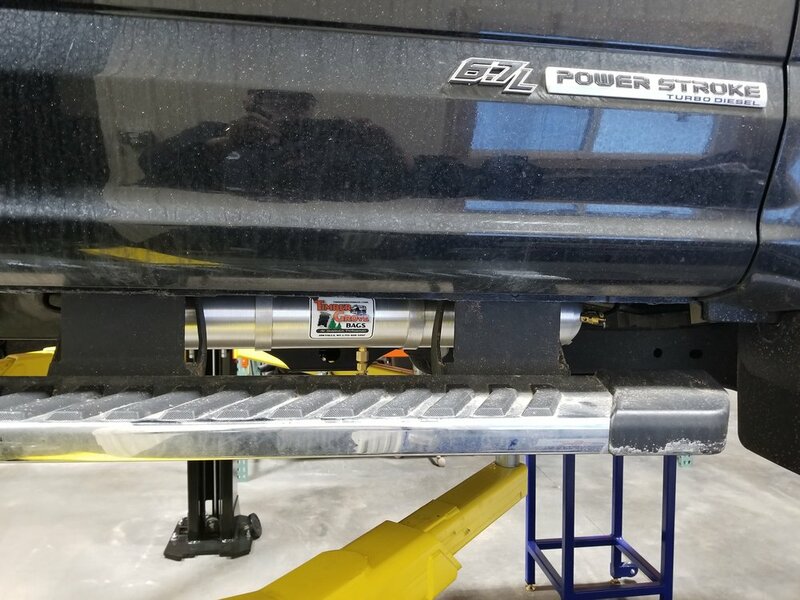 Ford F250/F350 rear axle ASAM’s are 100% bolt-in, no cut, no drill easy to install kits that assist factory suspensions with over 6,000 lbs of vertical lift. Standard kits ship with one manual air fill valve. Secondary valves and fully Automatic Air Systems are optional. 11’-16’ ASAM’s have different mounting systems. They are available, pictures will be added soon. Please “Contact Us” with any questions. We have not had an opportunity to test ASAM’s on 4x2 or dual rear wheel trucks. We believe mounts will fit great, but cannot be sure until a customer install is performed. Automatic air systems are 100% bolt-in design and tested on Crew Cab models. Regular and Super Cab may require a different air tank mount. Please “Contact Us” for information. This kit is a simple 100% bolt-in installation. Assists rear suspension with over 6,000 lbs of adjustable vertical lift. Kit includes all mounts, hardware, DOT single fill air lines & DOT brass push-to-connect fittings. All air lines, fittings, hardware and plug and play wiring harness. All the tech support you may need. Please contact us for DRW fitment. This is a 100% bolt in kit that includes air lines, push-to-connect fittings and hardware. Air springs are 2600 D1’s rated at 6,100 lbs of vertical lift.